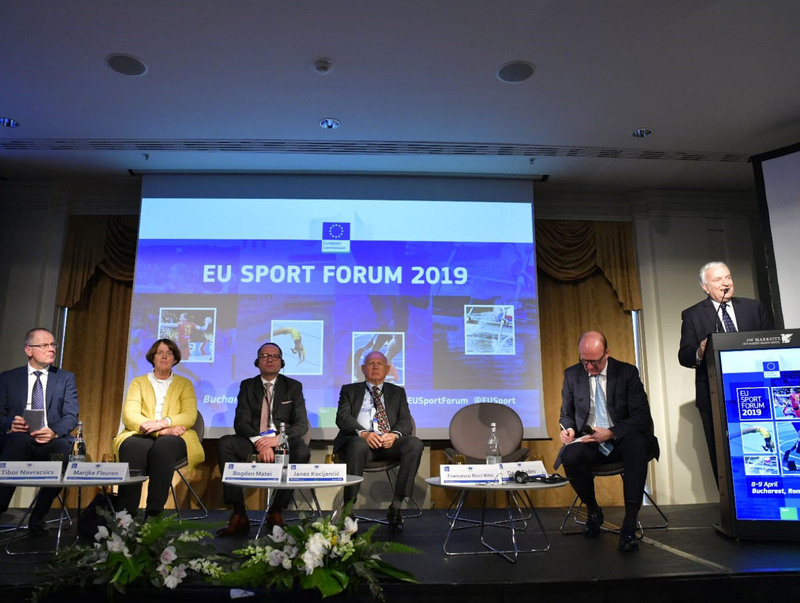 The EU Sport Forum 2019 concluded in Bucharest, Romania on 9 April with insight into many of the issues currently facing European sport from some of the continent’s leading athletes, sports administrators, and other distinguished guests. It was attended by a record 491 participants. The EOC President was joined on the panel by Marijke Fleuren, President, European Hockey Federation (EHF) and International Hockey Federation (IHF) Executive Board member; Bogdan Matei, Romanian Minister of Youth and Sports; Tibor Navracsics, EU Commissioner for Education, Culture, Youth and Sport; and Francesco Ricci Bitti, President, Association of Summer Olympic International Federations. Other topics discussed on the first day included empowering girls through sport, doping in sport, the rights and interests of athletes, how Europe can attract more major sports events, and the role of schools in promoting healthy lifestyles. Notable panellists included Sergey Bubka, Ukrainian NOC President and IOC Member; Roxana Márácineanu, French Minister of Sports; Pál Schmitt, Former President of Hungary, Member of the International Olympic Committee; Danka Bartekova, Vice-Chair of the IOC Athletes’ Commission; and many others. Mayor of Bucharest Gabriela Firea opened the two-day Forum. Day two started with a Plenary Session from Yves Le Lostecque, Head of Sport Unit, DG EAC, European Commission, who provided an update on European Commission activities. This was followed by two parallel sessions, one on the protection of sports rights in the EU, and the other on why and how grassroots sports should be financed. Folker Hellmund, Director of the European Olympic Committees EU Office, was on the panel for the second session. “Why are we still asking why?” Hellmund posed. “The answer: there are persistent issues regarding health, social inclusion, values and employability that sport can address. Two additional parallel sessions on justice in sport and the challenges of less popular sports followed. The Forum was brought to a close with a final Plenary Session on how Europeans will engage in sport in the future. Speaking on the panel for the final Plenary Session was EOC Vice-President and President of the National Olympic Committee and Sports Confederation of Denmark (DIF) Niels Nygaard. “The Danish NOC has asked sport clubs to be more flexible regarding their sport offers to better answer the new ways people want to do sport. More flexibility on training schedules is essential,” Nygaard said, referring to the evolution of sport clubs in Denmark.